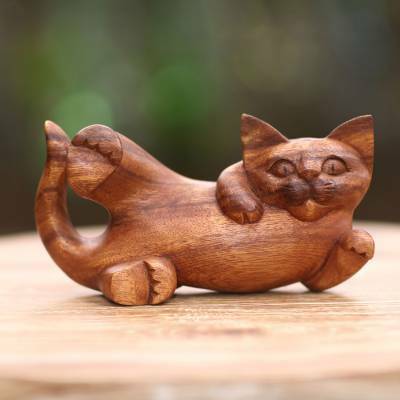 Balinese Signed Hand Carved Cat Sculpture in Wood, "Naughty Kitty"
Carved by hand from suar wood, a playful kitten looks naughty. Eka presents this charming feline sculpture, detailing the cat's plump tummy, busy paws and mischievous eyes. The sculpture is designed to rest on its side or on its back. You can find wood sculpture 'Naughty Kitty' by Eka in sculpture categories such as Animal Themed Sculpture and Wood Sculpture. Enjoy exploring these sections for other Novica treasures.